Continual sediment accumulation in Capitol Lake since the damming of the Deschutes River in 1951 has altered the initial morphology of the basin. As part of the Deschutes River Estuary Feasibility Study (DEFS), the United States Geological Survey (USGS) was tasked to model how tidal and storm processes will influence the river, lake and lower Budd Inlet should estuary restoration occur. Understanding these mechanisms will assist in developing a scientifically sound assessment on the feasibility of restoring the estuary. The goals of the DEFS are as follows. Increase understanding of the estuary alternative to the same level as managing the lake environment. Determine the potential to create a viable, self sustaining estuary at Capitol Lake, given all the existing physical constraints and the urban setting. Create a net-benefit matrix which will allow a fair evaluation of overall benefits and costs of various alternative scenarios. Provide the completed study to the CLAMP Steering Committee so that a recommendation about a long-term aquatic environment of the basin can be made. The hydrodynamic and sediment transport modeling task developed a number of different model simulations using a process-based morphological model, Delft3D, to help address these goals. 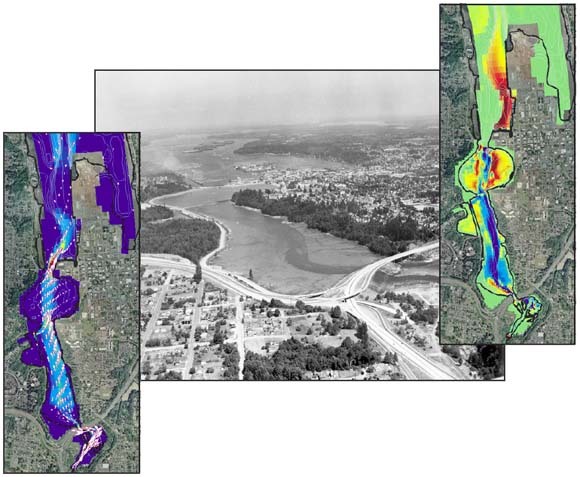 Modeling results provide a qualitative assessment of estuarine behavior both prior to dam construction and after various post-dam removal scenarios. Quantitative data from the model is used in the companion biological assessment and engineering design components of the overall study. Overall, the modeling study found that after dam removal, tidal and estuarine processes are immediately restored, with marine water from Budd Inlet carried into North and Middle Basin on each rising tide and mud flats being exposed with each falling tide. Within the first year after dam removal, tidal processes, along with the occasional river floods, act to modify the estuary bed by redistributing sediment through erosion and deposition. The morphological response of the bed is rapid during the first couple of years, then slows as a dynamic equilibrium is reached within three to five years. By ten years after dam removal, the overall hydrodynamic and morphologic behavior of the estuary is similar to the pre-dam estuary, with the exception of South Basin, which has been permanently modified by human activities. In addition to a qualitative assessment of estuarine behavior, process-based modeling provides the ability address specific questions to help to inform decision-making. Considering that predicting future conditions of a complex estuarine environment is wrought with uncertainties, quantitative results in this report are often expressed in terms of ranges of possible outcomes. Download the main text of this report as a 222-page PDF (of2006-1318.pdf; 34.4 MB). Download the two appendixes of this report as a 177-page PDF (of2006-1318_appendixes.pdf; 1.3 MB). Metadata in html form (CapitolLakeSeds.html; 16 KB). Metadata in FAQ form (CapitolLakeSeds.faq.html; 16 KB). Metadata in ASCII form (CapitolLakeSeds.txt; 8 KB). Metadata in XML form (CapitolLakeSeds.xml; 8 KB). For questions about the content of this report, contact Douglas George.